The upper school’s junior varsity boys, varsity girls and varsity boys soccer teams emerged victorious at this year’s Kicks Against Cancer Games. The sixth-annual fundraiser benefits Camp Okizu, a program for families affected by childhood cancer. The amount raised by the late-January event is still being tallied, as donations continued to roll in after the games. Last year, Kicks Against Cancer raised nearly $12,000. The event comprised three back-to-back games. First up, the junior varsity boys played Woodside Priory, winning 7-0. 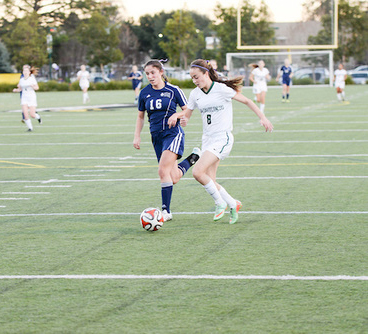 Next, the varsity girls beat Notre Dame San Jose 2-0. In the final match of the evening, the varsity boys triumphed over Woodside Priory 2-0. Onlookers had the opportunity to buy T-shirts and wristbands, as well as make monetary donations, to support the effort. During halftime of the last game, spectators were given a chance to play “Butts Up” with some faculty members lined up on the goal line. Cheerleaders, meanwhile, performed a special routine. Camp Okizu is a week-long summer camp that gives cancer patients and their siblings a sense of normalcy and stability. The camp is free of charge to attendees, but it costs $700 to $1,000 to provide a week-long camp experience for one child. Therefore, the camp relies on donations, making fundraising efforts incredibly important. For more information, visit the camp website at http://okizu.org/faq/. To read about another Harker effort in support of Camp Okizu: http://news.harker.org/ninth-annual-cancer-walk-raises-over-10000-for-camp-okizu/.